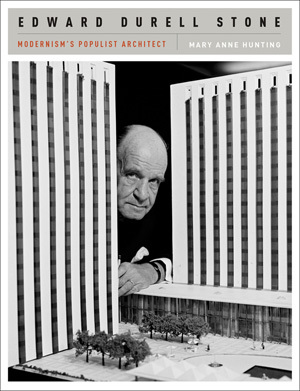 “Colossus,” “visionary,” “giant” are terms used to describe Edward Durell Stone (1902–1978), the mid-twentieth century celebrity architect whose popular aesthetic of “new romanticism” played a role in defining postwar American modernism. Architectural historian Mary Anne Hunting will discuss the recent interest in Stone’s architecture, which has been spurred by the reconsideration of a number of his buildings–especially the controversial conversion of his most flamboyant New York building, former Gallery of Modern Art (1958–64) at 2 Columbus Circle. Stone's skyscrapers included commissions for New York's 50-story General Motors Building (1963-58) and the 83-story Standard Oil Building (1970-1974) in Chicago. Mary Anne Hunting will discuss Stone’s work, placing his aspirations of giving form to the aspirations of an emerging consumer culture. Mary Anne Hunting received her doctorate from the City University of New York’s Graduate Center and a master’s degree in the history of decorative arts and design from the Cooper-Hewitt, National Design Museum/Parsons School of Design.